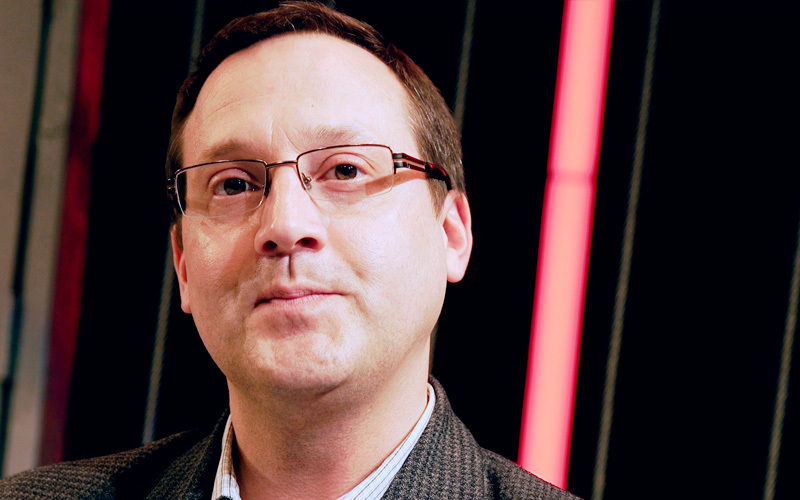 Kirk Domer has had many successes both at Michigan State University and in the professional theatre world. Since he took the reins as Chairperson of the Department of Theatre in 2011 (and as Acting Chairperson in 2009-2010), the department has opened a 9,370-square-foot, state-of-the-art Scene Shop and a new courtyard for Summer Circle Theatre; the MSU Auditorium has been almost completely renovated; and several programs have been introduced, including the first linked BFA/MFA program at MSU, which began in 2012, and the recently launched Musical Theatre Immersion Program with Wharton Center that includes a new Musical Theatre Touring Company. 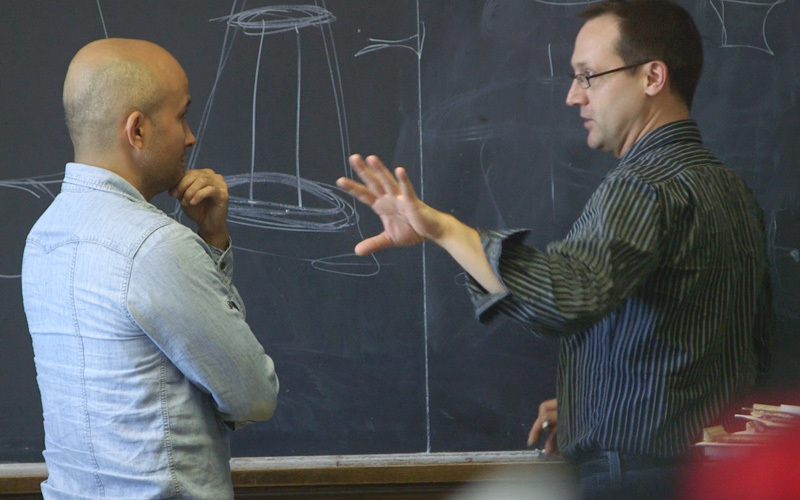 In addition to his responsibilities as Chairperson, Domer, a Professor of Scene Design, teaches design and technology classes, including the graduate seminar in production design. He also teaches the senior seminar, which prepares undergraduate Theatre students for their careers in the arts and beyond. 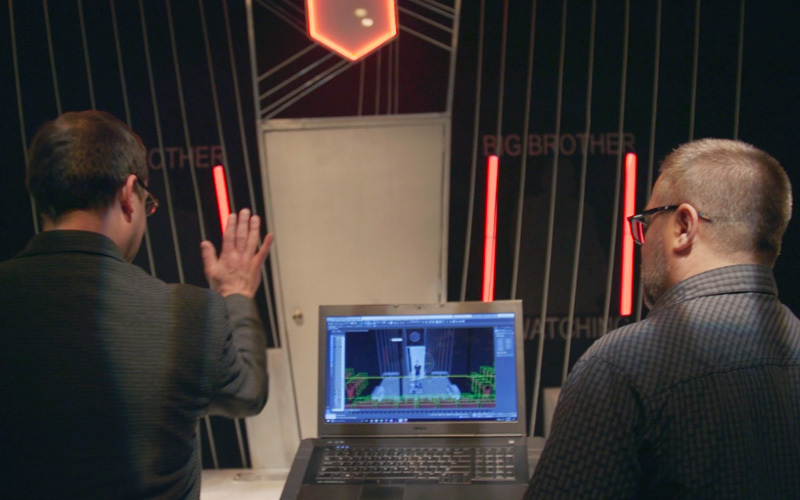 Kirk Domer walks through the 3D model of his set design for “1984”. To stay on the top of his game, Domer is continuously working on his craft. He has designed scenery, projections, and props throughout the country, including the world premiere of Ernie, a theatrical tribute to Detroit’s Ernie Harwell written by Mitch Albom, which has been running for the past seven years throughout the state of Michigan and Florida. It is absolutely necessary, in so many ways, to continue doing your artwork while you are an art professor. I design constantly. “It is absolutely necessary, in so many ways, to continue doing your artwork while you are an art professor. I design constantly,” Domer said. In 2015, he was the first professor in MSU’s Department of Theatre to be accepted in to the United Scenic Artists Local 829 Union, a labor union and professional association of designers, artists, and craftspeople. When working on a professional production, Domer often brings his students along with him as assistant designers to gain valuable experience. For instance, this past spring a student traveled with him to Houston, Texas, to help open the musical comedy, Five Course Love. More recently, a student worked alongside Domer on the Williamston Theatre’s production of 1984. Those added experiential learning opportunities are unbelievable. It’s what I received when I was an undergrad, and it’s what I want to provide to my students. Under Domer’s leadership, MSU Theatre students are learning within a diverse set of facilities on campus. 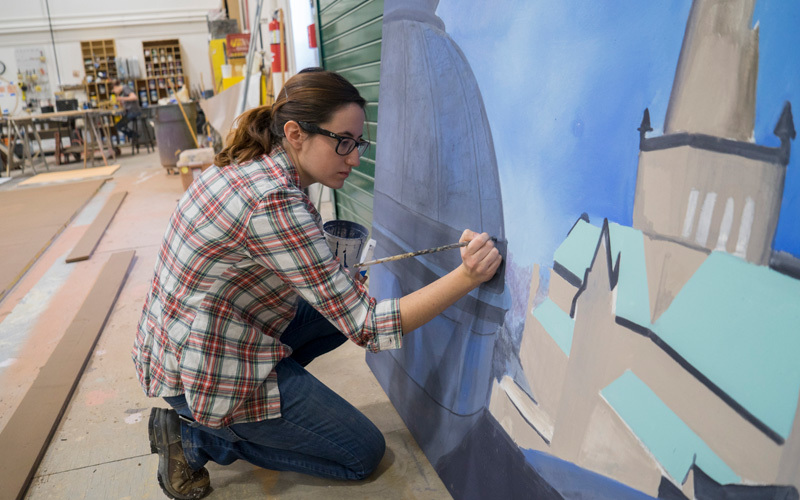 Theatre student Melissa Hunter paints inside the 9,000+ square-foot scene shop that launched in 2016. At the same time, students also work in the basement of the MSU Auditorium without the latest technologies or a lot of amenities. This is done on purpose. 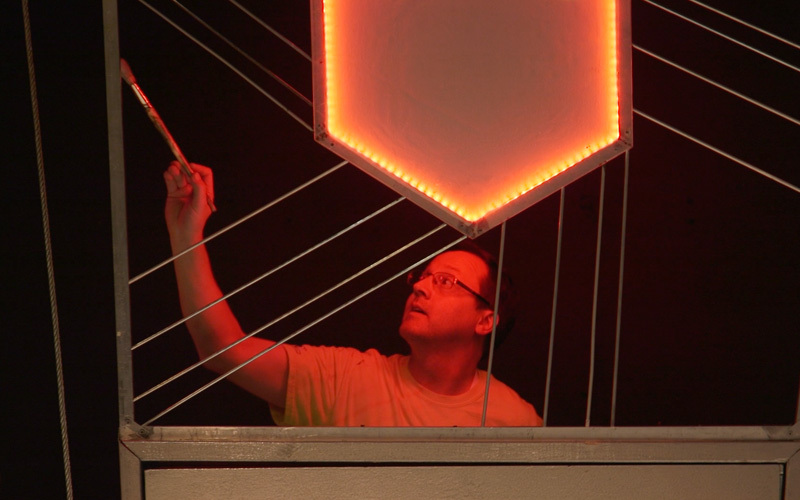 Kirk Domer collaborating with graduate student Hernando Claros on a new theatre project. Domer was first drawn to theatre as a kindergartener when he performed as a toy soldier in a school play. He also grew up in his father’s woodshop outside their family home and would build things with his dad because he liked constructing and making things with his hands. His defining design moment came as a college sophomore when his professor couldn’t take a job in San Francisco working for a touring circus company designing props. That professor and mentor (Kenneth Martin) recommended Domer for the job. Kirk Domer paints the set of “1984”. There are moments I question why I do what I am doing…but once you see it all come together, you forget about all of it, and say, this is exactly why I do what I do.